Barred Owl (Strix varia) This is a large woodland owl with plumage designed to provide good camouflage in forested settings. The Barred Owl is stocky in shape, with a short tail and broad wings; the sexes look alike, but the female is generally larger. The head is rounded, and lacks ear tufts like those of the larger Great Horned Owl; a large facial disc of pale brownish-gray, concentrically barred feathers surrounds dark brown eyes. The upper parts are broadly and regularly barred a pale buff and deep brown, the breast is barred brown and buff, and the belly is streaked lengthwise with brown - an overall color and pattern that helps this owl blend into the dappled filtering of sunlight through trees. This species resembles its close relative, the Northern Spotted Owl, but differs in several ways: the Barred Owl is lighter in color, is larger, has a paler face, has a brighter, buffy-yellow bill, and has a streaked belly. Fledglings of the two species both have a banded upper wing pattern and look almost alike, but Barred Owl fledglings have broader wing-bands. Breezy fell from his nest over 60 feet above onto the bank of a river. He was partially submerged and struggling to stand. He received a broken leg and was also blind for over a month due to severe head trauma. He has since regained some vision but can only see shadows due to retinal damage. He is non-releasable due to his permanent eye injury. He is permitted to Lila Arnold who holds both state and federal permits to possess for educational purposes. Size - Length: 21" ave. Wing Span: ave. 42" ave. Weight: 1.6 lb. ave. Status - State and federally protected. Habitat - Found in dense coniferous forests or mixed deciduous-evergreen woodlands, from moist river bottoms and wooded swamps to upland woods. Diet - The Barred Owl is a semi-nocturnal to nocturnal hunter. Small mammals, especially rodents, form most of the diet. This owl is also an opportunistic hunter who will take whatever is available, and birds, fish, reptiles, amphibians, or insects will make an acceptable meal. Perch hunting is a favorite technique -- the owl locates prey by sound or sight from a high perch, and swoops down from above to make the kill. The Barred Owl and the Northern Spotted Owl hunt in the same way and seek the same prey, which causes problems where the ranges of these two owls overlap. 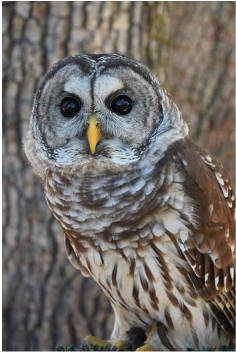 The Barred Owl has the advantage of being larger, and tends to win any competition for food between these two species. Call - A very distinctive, nine-note, barking call of hoohooho-ho, hoohooho-hoooooaw, ending on a rolling note. Similar to the call of the Northern Spotted Owl, but longer and lower in pitch. Other, shorter vocalizations are also made. Nesting - Uses tree cavities, or abandoned nests of other species. Most Common Problems - Collisions with vehicles is a common cause of injury, and pesticide poisoning is a hazard in some areas. Destruction of woodland habitat from development or logging is a major problem for all woodland owls.